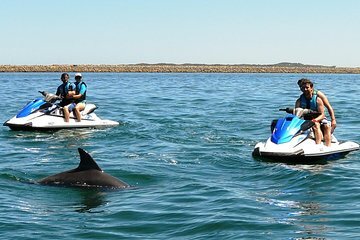 While visiting Perth, take a jet ski tour around Cockburn Sound and Garden Island to spot native wildlife and experience the thrill of jet skiing. Choose either a 1-hour or 1.5-hour tour with a ratio of one instructor-guide to three jet skis. Each vessel can hold up to two people, so you can either ride solo, or share a jet ski and take turns driving. Make your own way to the jet ski office in Rockingham to meet your guide. Receive a safety briefing and equipment, then zip around the waters of Cockburn Sound on your choice of two guided tours. This mid-paced tour focuses on the marine wildlife and Garden Island, with the chance to spot marine wildlife such as dolphins, sea lions, and seabirds. Suitable for all levels of experience. Maximize your time on the water during a 25-mile (40-km) journey around Garden Island and along the sound. Put your skills to the test as you feel the power of the jet ski. You can even try advanced maneuvers in the freestyle area towards the end of the tour.